All good games force their players to make interesting choices. 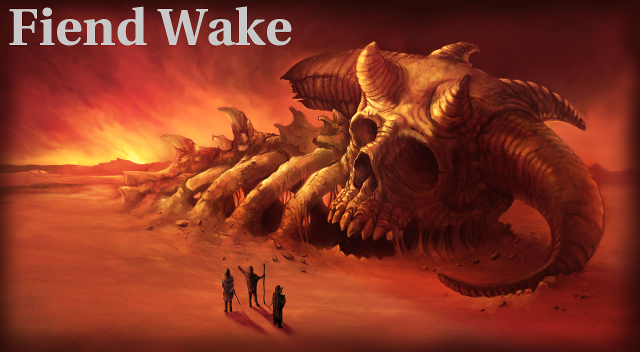 We hope that playing Fiend Wake will do just that. When you build your character, you’re going to choose between races, nations, and professions that will all come with their own mechanical significance that can change the way you play – hopefully in interesting ways. As you play the game, the GM will also be presenting you with a series of choices; introducing you to characters and situations where you, the players will be forced to ask many questions: how can my character achieve goals in this environment? What skills did I give my character that will help? What things can I do to make the situation more fun for me and my fellow players? There are many RPG groups that will deride players who put much emphasis on the mechanical aspects of a game. They get called munchkins, twinks, power-gamers, hack-and-slash thugs, murder-hobos, and are generally frowned upon. While it’s true that the soft side of RPG’s are very compelling and important, you should never disregard the fact that the story is still shaped by the way the dice fall and your character’s personality should be as expressed by the way the mechanics play out as by the way you handle the interpersonal stuff. Never let the fact that Virtue is an objective number delude you into thinking that morality is achievable by any formula. It’s important to understand that everyone in Fiend Wake knows that they want to be virtuous but they disagree on how to get there. Throughout the game, we encourage players and game masters alike to pose difficult moral questions. Is it ethical to kill an innocent who is infested by The Fouled while knowing that, if left alive, the infestation could result in dozens more deaths? Is it ever unethical to kill a being that is unquestionably an embodiment of evil but who hasn’t gotten around to harming anybody yet? When (if ever) will your character say that virtue point loss is a worthy price to pay for a greater good? These are some of the most compelling choices a player can confront. Situations where these sorts of questions hang are precisely the ones that give die rolls profound meaning. Try keeping a journal as you play and write down the ethical decisions your character makes. It can be fun to see if and how your character changes with time. Because the GM controls all non-player characters — including the ones that happen to be your enemies — some players believe that their relationship with the GM is adversarial. Nothing could be further from the truth. Always remember that the GM is on your side and is just trying to offer interesting choices. Try not to overload the GM with demands or to befuddle the GM with irrelevant rules. Try to avoid distracting the GM or other players (especially when the GM is trying to tell you something pertinent to the game). Be a good citizen; wait your turn to speak and trust the GM’s judgment. Help the GM out. If you have a good and simple suggestion that would make the story more compelling, throw it out there! If running with the idea turns out to be awesome, thank the GM for all the invisible work that went into making your idea actually pan out. The GM, as a meat computer, doesn’t have a totally precise memory or the ability to process billions of instructions in a second. What the game master lacks in precision is made up for by great creativity. Remember this when you’re playing; the strengths of table-top games are creativity above all else. Just because the GM wants you to have a good time doesn’t mean the GM can or should indulge your every whim. A game that devolves into pure self-flagellation could scarcely be called a game at all. You’re going to be challenged and if you don’t like that, you’d better have a clear understanding with everyone else in the group about that or you will be disappointed. All the consideration that you should extend to the GM should go to the players as well. Managing a character can be challenging and you should be supportive of this whenever you can. Accept other players' feedback. You don’t have to compromise your integrity to the character in order to appreciate the ways that you can adapt to the needs of the group. Never hold in-character actions against the players. Give everyone at the table the benefit of the doubt. You can rob yourself of a lot of enjoyment if you assume that a character’s actions are somehow intended as a personal slight against you, the player. Remember that in-party rivalry can be one of the best way to force your characters to make difficult (interesting) decisions. At the same time, if you notice that another player struggles with this very concept, extend a little understanding and don’t let your character ruin the wholesome feeling that should prevail for the players at the table. It doesn’t have to be wholesome for the characters themselves if your group is good-natured about it. Being able to shake hands and say “my character hates your character and that’s why we’re awesome together” is evidence you’re probably doing it right. As long as you focus on playing the role and not playing the other people in your group, any character dynamic can be entertaining. Including a total self-destruction of your party. In the name of good drama, be open to the beauty of a Shakespearean tragedy as well as the victorious epics. You might be the sort of person who knows that tanks and longswords never coexisted on any battlefield in Earth’s history. You might even be the sort who isn’t able to accept “it’s just a game” or “this isn’t Earth” as justifications. Try thinking of it this way: Before the Fiend War, the world was as technologically developed as early 18th century Earth. But then the demons came, killed a zillion people, destroyed libraries, economies and entire civilizations, and hurled everybody back to the stone age. With recovering industrial capabilities and constant rediscovery effort, society is limping its way back to some sort of respectable technologies. It’s a slow process and it’s hard to keep it going when The Fouled are constantly wiping out capital. Whatever odd things have survived this constant brutality is what people have. They don’t have a lot of time or money to replace things so you find a whole plethora of technologies coexisting. But seriously, it’s just a game.